If aikido is so damn good and superior how come we don’t see it in MMA? It’s a great question. You see the founder of aikido travelled Japan taking on many challengers in the development of his art, and his teacher honed his skills on the battlefield. In a way, aikido began as the very definition of MMA: that is, a mixed martial art combining open-hand striking techniques with wrestling and joint locks as well as swords, staves and knives. Weapons certainly aren’t a part of the modern day octagon! The founder expressly forbade aikido practitioners from engaging in competition. Yet he himself and many of his top students took on all comers in private matches. Surely it’s the same thing proving that the art works and constantly challenging yourself? The techniques in aikido are killing techniques and are too dangerous to be used in competition. Pretty suckful answer but there is a grain of truth to it. Aikido after all was the skill set of the armed samurai — I can’t see the rules of any MMA tournament allowing contestants to enter with a metre-long razor blade. I think that this has become a useful excuse for aikido people to avoid being challenged or threatened. The MMA comps look pretty dangerous to me! Others might argue that two blokes going face to face in a ring on a semi-padded floor deprives aikido practitioners of their early warning skills and deprives a throw of its full effectiveness. Aikido is about peace and harmony — why would any practitioner of the true aikido want to step into the ring? Claiming the moral high ground somehow denigrates MMA as beneath the righteous superiority of aikido practitioners. While it’s convenient it somehow dodges the fact that aikido is a martial art. 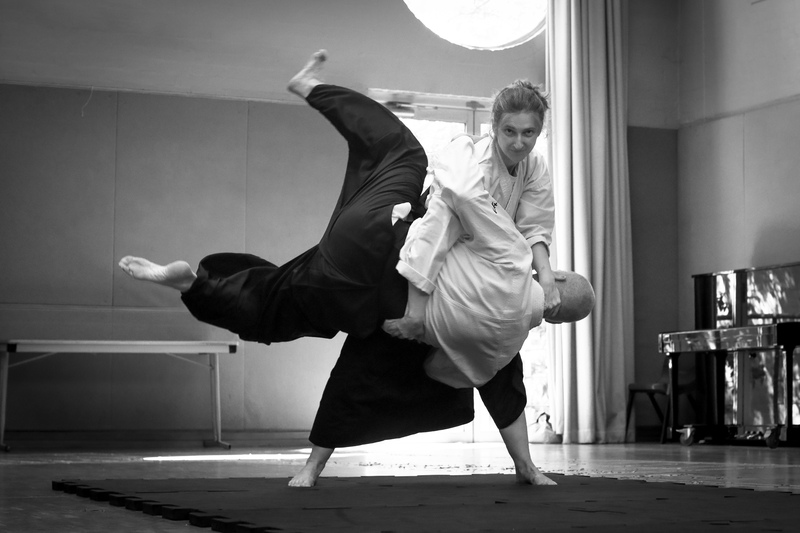 Aikido was battlefield-tested and probably needs to remain tested to keep the practice honest. Anyone practicing aikido purely for its morality needs to understand that aikido is based on martial practice and that this is the path the founder set out to follow in developing peace and harmony. My personal view is that aikido as we learn it today is kata only. The application of that kata looks somewhat different once we incorporate the principles underpinning aikido together with O-sensei’s oft quoted but poorly adopted ‘aikido is 90% atemi’. Fortunately through our Atemi-jutsu (Target Focus Training) we are able to tap into the science of combat to keep our training real and relevant.